Roaches can survive weeks and sometimes months without food, but they can’t live long without water. This is particularly true for the Dubia roach. Blaptica dubia is adapted for life in Central and South American rain forests where water is abundant and nutrition often scarce. Whether you’re setting up a Dubia roach colony for breeding or just keeping a few as feeders, you’ll need to figure out how to provide them with regular, reliable moisture. This guide to watering Dubia roaches will show you how to do that. It contains information about watering methods including what the options and issues are and how to choose and implement the one that’s right for you and your Dubia roach colony. On the surface, this probably sounds pretty obvious. It makes sense that tropical insects need plenty of water, and in our experience it is true that lack of hydration has a particularly negative effect on B. Dubia. However, with Dubia roaches, hydration is not just for sustaining a colony or a few bugs. The health of roaches and other feeder insects also has a direct effect on the animals that eat them. Hydrated roaches are healthy roaches. They breed faster, live longer, and they are more nutritious feeders. The bottom line is that you need abundant water to breed, raise, and even just sustain healthy Dubia roach feeders. The good news is that providing water for Dubia roaches is fairly simple. There are plenty of easy, inexpensive options, and this guide will help you decide which method is best for you. The following article is fairly long, so feel free to use it as reference when you have hydration issues or questions. In the end, deciding on a watering method is fairly painless once you know your options. It’s figuring out the details about how, why, and when to use each method as well as the relative advantages of each that requires effort. But it’s all effort up-front, so you only have to do it once. Why is hydration so important for Dubia roaches? In short, hydration directly affects Dubia roach growth and reproduction. Dehydration and even sub-optimal hydration is a cause of stress for insects. This forces them to divert internal resources to deal with the stress. These are resources that would have otherwise been used for growth, reproduction, repair, and even direct nutrition for your animals. Diverting resources from growth and reproduction to overcome stress diminishes the quality of feeder and breeder roaches. While compromises are inevitable and nothing is ever perfect, raising vigorous roaches that can handle unavoidable health and stress issues requires that you avoid problems that can be easily avoided. Dehydration is one such avoidable issue. The fewer physiological hurdles your Dubia have to jump, the better. So as a general rule, avoid causing roaches any unnecessary physiological stress. A colony might be healthy and capable of dealing with it, but you can never know for sure. All things equal, physically stressed insects are by definition less healthy than unstressed ones. And there is a correlation between health and productivity. Fortunately, dehydration and its accompanying stress is easily avoided. Dubia roaches are efficient protein processors. What they don’t use immediately may be stored as uric acid (pdf) (external link) for later use when times are lean. Using stored uric acid, or “non-protein nitrogen”, as it’s known, evolved as an adaptation to a low-protein environment. Dubia and some other roach species can even digest the cellulose in plant matter with the help of special bacteria growing in their guts. Talk about low protein! As byproducts of digestion, these bacteria produce nutrients the roaches can use. One of those nutrients is uric acid. Uric acid seems to serve two purposes: First, it’s stored protein for on-tap energy when it’s needed. Second, it regulates hydration. Urea salts hold water, which helps roaches survive when water is scarce. So it seems uric acid helps Dubia roaches deal with scarcity. This makes intuitive sense. Roaches are scavengers after all. They rely on favorable environmental conditions outside their control to survive. Those that survive famine live to pass along their genes to future generations. This is a successful strategy for roaches. It works well in the wild, but it doesn’t work nearly as well in captivity where food and water are abundant. Captive Dubia roaches typically get way more protein than they need, and too much of the wrong protein at that. Several things happen when Dubia roaches gorge on high protein foods. Their tissues fill up with urea, more water is stored, and they become stressed. This is probably not a big deal if they’re indulging in occasional high protein meals, but protein is often regularly available in captivity. Results from the Mullins and Cochran uric acid study linked above show that uric acid steadily increases to unhealthy levels when American cockroaches are fed a diet containing 50% casein protein. And once high protein takes hold, it may be very hard to reduce it. 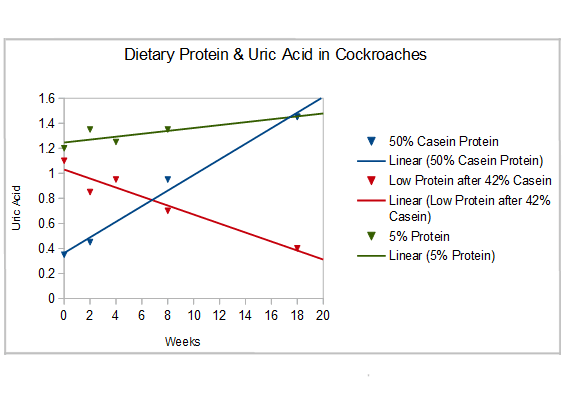 Among roaches loaded up on high protein for six weeks, only a protein-free diet brought uric acid levels back down. It actually rose further on just a 5% protein diet, albeit at a slower rate. What does this mean for roach-keepers? The data suggest too much casein protein overloads the roach’s scarcity coping mechanism. Uric acid is toxic at high levels. It causes gout, kidney stones, and when severely overloaded it can even cause death. We’ve seen this firsthand. When dietary protein reaches a certain level, Dubia roach growth slows, fertility declines, and mortality rises. Before reaching overload, roaches will just store excess uric acid and adequate hydration helps them process and flush excess metabolites and salts. As an aside, the real solution to excess protein in the Dubia roach diet is to feed them less protein. Water helps them deal with the excess, but it is not a solution. We wrote a detailed article about the Dubia roach/dietary protein issue. Feel free to check it out if you want more information. For now though – sticking with hydration – you want to support waste removal. One way to do that is by supplying plenty of water. Moderate to high humidity is important for Dubia roaches. They need it to help with molting, and reproduction slows when humidity dips too low. Consider that they come from tropical rain forest and are adapted to that environment. They even have specialized sensors on their antennae that allow them to detect environmental humidity. They use these sensors to relocate to areas of higher humidity when they’re dehydrated. If you’re keeping a few roaches as feeders it’s probably not necessary to worry too much about humidity. But if you’re keeping them for more than say a month, or if you want them to breed, you should keep humidity at a minimum of 40%. Higher is OK – perhaps even desirable – but lower probably isn’t. In our experience, Dubia roach reproduction declines along with humidity. A water source appropriate for your setup and situation can help maintain humidity. If you’re buying Dubia roaches as feeders or taking the time to breed them yourself, you care about the health of your animals. You’re going out of your way to provide what many consider to be the most nutritious feeder insect, and you expect Dubia roaches to be worth the trouble. Reason number three to keep your Dubia roaches hydrated is that your animals ingest a higher waste:moisture ratio when they eat roaches full of uric acid and stressed out by dehydration. When that happens, they have to use their own resources to eliminate not just their own waste products, but also those of the roach they just ate. And because that roach was dehydrated, your animal now has less water to deal with waste than it otherwise would have had if the roach was adequately hydrated. But wait…there’s more: Stressed out dehydrated feeders provide your animals with a lower ratio of nutritious stuff to bad stuff. Generally speaking, captive herps already suffer from dehydration (external link). All things equal, they need more moisture on average, not less. Ideally you should be feeding properly nourished and hydrated Dubia roaches to your animals. So now that you’re convinced that feeding dehydrated bugs to captive herps and other animals is a bad idea, you may be wondering about the best way to get water to your roaches. There are quite a few good options, actually. Water crystals are probably the most commonly used method right now. They’re definitely the most hyped. Water crystals work well, but they aren’t inevitable. We use them often but the won’t be right for every situation. They aren’t even right for us in every situation. So a little bit of background, then on to the watering methods. As you may know, Dubia roaches can’t handle standing water of any depth. This is almost literally true. They’re great climbers, but they’re horrible swimmers. While there are several species of aquatic arthropods, Dubia roaches aren’t one of them. They have very simple nervous systems, and we’ve seen these poor guys succumb to what was barely a drop or two of water that they could have easily escaped if they were just willing to leave the comfort of their current location. B. dubia originates from South and Central American rain forests in countries like Guyana and Argentina, and you would think they could handle a little water. But they can’t. If you give these drown-prone roaches a chance to drown, they will. Water crystals (or water gel) is a super-absorbent polyacrylamide hydrogel that was first discovered by the USDA around 1960. They are generally recognized as safe in the U.S.. Polyacrylamide has been shown to be non-toxic to humans, animals, and plants. However, it breaks down into several components that includes acrylamide. According to the FDA, Acrylamide is especially abundant in fried foods (external link), but it is also found in roasted or baked foods – essentially those cooked at high temperatures. The FDA lists acrylamide as a potential carcinogen because it causes cancer in animals at very high doses, but they also say consumers are safe and should take no particular precautions to avoid it – beyond eating a sensible diet. We’ll leave it to you to make a determination about the safety of water crystals. We think they’re probably safe for consumption by our animals given the very small amount the roaches actually ingest. When dried-out water crystals from a large colony are re-hydrated, the amount that remains looks just about exactly the same as the amount you started with. If you want to use water crystals but have health concerns, you can use a different watering method for a week or more prior to feeding off your roaches. This increases the chance any ingested acrylamide – if this is in fact a thing – would be flushed out of the system. If you’re still concerned, read on. You can always choose another watering method. With respect to humidity, water crystals are adequate. They boost colony humidity subject to the amount of heat, ventilation, and circulation in the enclosure. Water crystals tend to dry out pretty fast at the higher temperatures required for Dubia breeding, so it’s important to keep an eye on them. Most people assume water crystals are highly consumable, and that if you want to use them you have to constantly keep buying more, but that doesn’t actually have to be true. All things equal, dried out water crystals from a roach enclosure are about the same volume as the ones you poured out of the bag. Gardeners say they can last as long as six years in the ground where they’re used to increase soil moisture, so they can be washed if necessary, re-hydrated, and reused. If you do this, be careful about bacteria. They do tend to get a bit nasty, so we often throw out what remains and start fresh. This is as it sounds. It’s giving your roaches nothing to “drink” but fresh fruits and vegetables. Some people find this surprising, but it shouldn’t be. Dubia roaches in the wild get their hydration primarily from vegetation. As opportunistic feeders, they can consume much of the plant matter they come across in the rain forest. Their “natural diet” includes moist rotting leaves, bark, moss, and other vegetation that at least occasionally (but probably only occasionally) includes fruits and vegetables. Fruits & vegetables do a good job hydrating roaches but they don’t do much for enclosure humidity. If there’s already enough moisture in the air you don’t need to be concerned, but humidity is a concern in drier parts of the U.S., or where household humidity is reduced by central heating or air conditioning. In these cases, the lack of humidity from fruit and vegetables is something to consider. Low humidity doesn’t mean you can’t feed your Dubia roaches fresh fruits and vegetables. It means you need to consider a supplemental hydration/humidifying method. While there are significant benefits to providing fresh fruits and vegetables, there are also drawbacks. Nothing huge, but they’re worth considering. Since you’re (hopefully) providing your Dubia roach colony with a hot, moist environment, vegetables and particularly fruits will break down quickly and rot. The result is a smelly mess that is potentially dangerous if mold takes hold. Be careful to avoid mold. Dubia roaches eat rotting plant matter in the wild, but they aren’t living in hot, poorly ventilated enclosures that they can’t escape. Mold can take hold in the span of a single day in these conditions. Consider changing out vegetation at least every two days as a general rule. Don’t go much beyond that without an abundance of caution. Some roach-keepers really like sponges for watering their colonies. Sponges absorb moisture and are safe for use with roaches – poor swimmers that they are. They’re also reusable, hold a decent amount of water, and are fair to good at raising enclosure humidity. And you don’t have to change them out every day. The downside is that they have to be thoroughly cleaned regularly to avoid mold and bacteria and associated risks. Another issue with sponges is that you have to be careful about which kind you use. Not all sponges are created equal. These are a no-no! You’re forgiven if you’ve already used one in a pinch…or for a while. We strongly suggest staying away from sponges like the ones in yellow or green packs you buy at the grocery store for a dollar. Have you ever noticed that when you unwrap kitchen sponges they’re dry yet soft and supple. Have you seen them suds up when you hold a new sponge under running water? That’s some unknown chemical combination, and we doubt it’s good for either roaches or your animals. Synthetic kitchen sponges are made of polyurethane, which is a petroleum product, and we know petroleum products slow roach reproduction (external link). They also often contain chemicals like Triclosan, which is a pesticide! If you’re breeding Dubia roaches we probably don’t need to tell you to avoid pesticides. Same goes for those using them as feeders. If you use a “kitchen sponge”, we recommend searching for one that is chemical free. The alternative to kitchen sponges are sea sponges. These are a good choice for roach hydration. They’re natural and safe, which is already a vast improvement over most synthetic sponges. They also hold more water than kitchen sponges, and they’re surprisingly durable. When used and cared for properly, sea sponges tend to easily outlast synthetic kitchen sponges, which degrade quickly in warm, moist, dark environments (like your Dubia roach colony). Sea sponges may also disappear over time, but not because they become moldy and unusable or because they break down. It’s more by roach attrition. Roaches will nibble away at them little by little, day after day, and they tend to slowly disappear over time. This method is probably borrowed from cricket-keeping. Simply fold a paper towel (or several) into the desired size, wet it with water, then set it inside the enclosure. The roaches won’t drown and they can drink from the paper towel at will. It’s not a bad method for watering roaches. The towels hold moisture well because they have very small pores, but the smaller surface area tends to cause sogginess and foul towels relatively quickly. They need to be changed often. In our experience this is about every second day. There is also an issue with potential chemicals in paper towels. They are a highly processed paper product, and some chemicals in paper and pulp processing have been identified as endocrine disrupting. This is a bad thing if you’re a cockroach. It may be a bad thing if you’re a cockroach breeder too. The jury is in on paper towels for commercial use but still out for home use. They’re probably OK in a pinch for the home user with one Dubia colony that they maintain for personal use. They’re probably even safe to use for a while until you have a chance to work something else out, but out of concern for the health of the roaches and the animals they feed, we would recommend steering clear of paper towels as a long-term hydration strategy. 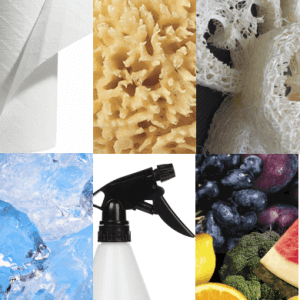 They may not be as bad as kitchen sponges, but we know they contain chemicals. We just aren’t sure which, so we give them a thumbs-down long-term. This option involves two methods – one for hydration and the other for humidity only. The hydration method is a moisture wick system that uses cotton or some other absorbent material to draw water up from the base of a container, wicking it to the surface. This is a simple device and it’s simple to make. Just find a jar with a tight-fitting lid and punch a hole in it that will be large enough to insert the wick material but not too large that it falls through or roaches can fall in. Cut the “wick” so it’s long enough to reach the bottom of the container and stick out the top. Insert the wick, fill with water, tighten the lid, and put it in the colony. It works well but it’s not a widely used watering method – probably because it takes effort for roaches to find the wick and get to it for a drink. But there may be some enterprising roach-keepers with clever ways of providing access for their roaches. The humidity only method is good for supplementing other watering methods in order to get higher humidity in an enclosure. This a quick & dirty method that can be used to boost overall colony humidity in a pinch. Or, it can be the primary humidifier. To try this method, grab a mason jar, pickle jar, or small plastic storage container – whatever you like that has an accompanying lid – and pour some water in it. Poke some small holes in the lid. You want airflow without any roaches falling into the jar. The lid could also be a screen, which can be fixed to the top with a rubber band, wire, or hot glue. Set the water-filled container with affixed lid in your enclosure and voila! Instant humidifier. Place it in a hot area for more humidity and a cooler area for less. We use this method in our colonies often. It’s very simple and easy, but there are a few things to keep in mind: First, it’s best to use short, wide containers than tall and thin ones. If it tips…sorry – when it tips – water will spill. Second, you can adjust humidity not just with the container’s placement but with its size, lid material, and hole size. The more water surface the higher the evaporation rate, and the more open the top the more moisture escapes. This method is intuitive and you can experiment to find the container/lid combination that works best for your situation. The last word on this hydration method is one of caution. Standing water (like what will exist when the jar tips over) is very bad for a colony of Dubia roaches. Take care to avoid it. If it occurs, clean it up right away. This is another humidity-only method that can be used with success but that requires caution. Spray bottles are a very good way to get a lot of moisture into the air quickly. We used to use it occasionally to boost the humidity of an entire room, and only rarely in or on an actual colony. It’s a bit risky, and we’ve worked out a better room-wide humidifying system for our colonies. If you do mist, spray only as much water as will completely evaporate within ten or twenty minutes, then wait at least a few hours before spraying again. You want to avoid excess moisture, as usual. This goes back to the potential for mold and bacteria. As an aside, most people who have at one time kept reptiles, amphibians, or arachnids know how fast mold and mildew can appear in a warm, wet enclosure. The slippery film that signals the beginning of mold inside a terrarium or vivarium only takes a few hours to form. If you ever see that happening in a Dubia colony, remove it quickly. This is similar to supplying just fruits and vegetables in that it works well for roach hydration but not for humidity. Dubia roaches will never eat the amount of wet food required to raise their enclosure’s humidity. If a colony could eat that much, they would consume it so fast it probably wouldn’t do much to boost humidity. The downside is that wet food needs frequent changing. Sometimes small amounts will dry out and won’t cause problems, but more often it seems to stay wet, get moldy, and stink up the enclosure. It’s a good hydration method, but it requires changing every day or every other day at the longest. Watering Dubia roaches with a luffa, like our Luffa Insect Water Dish, is safe, effective, inexpensive, and natural. The idea is to soak a piece of luffa in a shallow water dish, similar to the sponge watering method. However, the luffa allows roaches to drink not just water that is absorbed onto the surface of the luffa, but also directly from the water itself. It’s kind of a neat system with some advantages over other methods. The roaches don’t need to rely exclusively on absorption. This is good when the water level gets low and there isn’t enough of it to reach the outer surface of the luffa. It’s also less effected by temperature and evaporation. Depending on humidity and temperature, water can evaporate quickly from the surface of a sponge. this isn’t so much an issue with the luffa because roaches can climb down the luffa scaffolding and reach the water directly if they need to. We use this method in our colonies. It is very effective. It’s also reasonably safe for the drowning-prone Dubia roaches. while some inevitably succumb to the water, the numbers are very few. In fact, fewer roaches die with luffa than they do from walking around on water crystals. And luffa is reusable. It’s sturdy and easily cleaned. It gets a bit dirty as the roaches use it, but with a quick rinse it’s as good as new. Well almost. They do degrade over time, but it takes a while and they’re relatively cheap and easily replaced when needed. So these are the different methods used to hydrate Dubia roach colonies. You may not have to think much about humidity if you’re fortunate enough to live in a humid climate. Everyone else will need to take humidity into account when choosing a watering method. There are a lot of options, but we don’t think the final decision of which to use is difficult once you know the basics. You just have to consider your situation and make the best of it. We hope this information helps you find a hydration strategy that you’re happy with and that works for your situation. Let us know if you have any questions, and definitely let us know if you use some other hydration method we didn’t cover here. We’re always open to new ideas, and to adding something new to the list!